Kia ora. There’s a lot to learn about life in New Zealand. Known by Māori as Aotearoa, or “The Land of the Long White Cloud”, the Kiwi nation certainly does have a lot of long white clouds. These go well with their long white beaches and long white mountains. We’ve picked the most important things that any newcomer to New Zealand should know about, from slang and sheep to hobbits and sandflies. 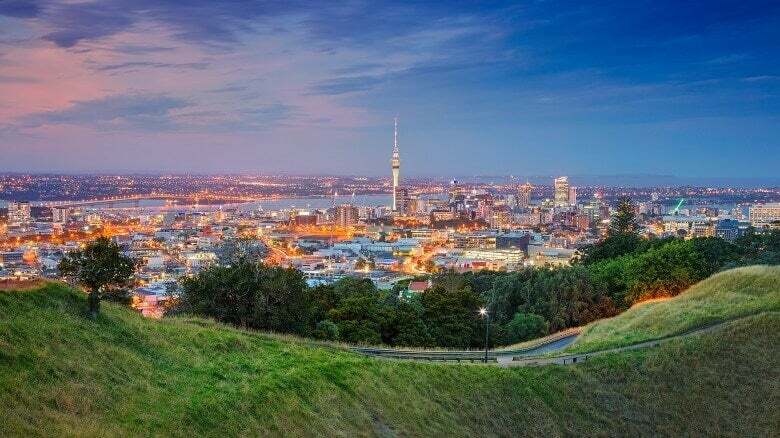 If you don’t think humans are great company, New Zealand will be perfect for you. In a country that’s about 20,000 sq km larger than the United Kingdom, there are only around 4.8 million people. Contrast that with the 66.5 million people living in the UK. What’s more, over 86% of Kiwis live in urban areas, so the countryside is a fairly empty experience. For some that means “lonely”, for others it’s wonderfully “people free”. On the other hand, you can’t move for sheep. They’re dotted all over the New Zealand landscape like fluffy white clouds, chomping grass and seriously outnumbering their human masters. That’s right, for every one New Zealander there are about six sheep. The total number of these woolly creatures is nearly 30 million, so in a sheep uprising the Kiwis would really have no chance; they’d get a sound bleating. The New Zealand accent can be pretty confusing for newcomers. A Kiwi can sound Australian, South African and American in the space of five words. If you’re moving over there, you should forget everything you’ve ever learnt about vowel sounds. An ‘i’ sounds more like ‘uh’, so ‘fish and chips’ becomes ‘fush and chups’. Meanwhile, an ‘e’ sounds more like an ‘i’, which can cause a whole world of confusion. ‘Bed’ sounds like ‘bid’, ‘ten’ sounds like ‘tin’, ‘deck’… well, you get the idea. You don’t need to learn a new language to live in New Zealand, but knowing some of the Kiwi lingo might be helpful. There are a lot of strange words and phrases flying around. Cling film is known as ‘glad wrap’, which makes it sound much more fun to use than it really is. A cool box is a ‘chilli bin’, a holiday home is a ‘bach’, flip-flops are ‘jandals’, and the middle of nowhere is known as the ‘wop wops’. If you’re just popping to the ‘dairy’ then you’re heading to the local shop (it doesn’t just relate to cheese and milk). Most importantly, if someone says ‘yeah-nah’, they’re not being indecisive – it’s just a very casual way of saying ‘no, thank you’. You know when you find a fiver down the back of the sofa? That’s sort of like what happened with us and New Zealand. The country was the final part of the world to be discovered by the human race. We thought we’d inhabited everywhere, then some East Polynesians went on a canoe trip and found two huge islands full of defenceless birds. What a find! Archaeological evidence suggests humans didn’t set foot on New Zealand until around 1250-1300. That’s over seven hundred years ago, but in historical terms that’s crazy late. These East Polynesians would become the indigenous New Zealanders known as Māori, who got there about three hundred years before the white men. Māori people didn’t always call themselves Māori. They belonged to different tribes (or iwi), such as Ngāpuhi and Ngāti Porou. However, once the Europeans (first the Dutch, the the British) set foot on New Zealand, the native people needed a way to differentiate themselves from the white invaders. So they came up with ‘Māori’, which means ‘ordinary’. Today, 14% of New Zealand’s population are ‘ordinary’ people, and Māori is one of the country’s official languages. There are lots of Māori place names in New Zealand, but you should know that ‘wh’ is pronounced with an ‘f’ sound, for example Whakapapa is actually Fakapapa. We all know shoes are just horrible foot prisons. They cost money, they smell, they can give you blisters, and nobody likes the dilemma of choosing which pair to wear. The Kiwi solution is just not to wear any. Over in New Zealand, some people step straight out of the house with nothing on their feet and it’s perfectly normal. You’ll see folk wandering the streets, supermarkets and cafes just totally barefoot and without a care in the world. This has got something to do with Kiwis being very laid back, and also the Māori belief that being barefoot brings you closer to nature. If you wander around shoeless and step in dog poo, don’t complain; you’re just connecting with the nature really well. Embrace it (but wash it off before you go into a supermarket). New Zealand might be fairly close to the hot and sunny land of Australia, but Kiwi weather is very different. Not only are the temperatures much less extreme than they are in Oz, but it’s also possible to have “four seasons in one day”. This saying was created by drama queens who like to exaggerate a bit. What they really mean is that it can be sunny one moment and rainy the next, which any Brit should be used to. It’s all down to location; the two islands of New Zealand are surrounded by some of the wildest seas in the world, which can make things rather exciting. A day might start out hot and sunny and by midday become a miserable blast of cold wind and rain, all thanks to the crazy Pacific Ocean. If you’re off exploring the wop wops, be sure to bring a brolly. We really need the Earth’s ozone layer to protect us from the sun’s harmful rays, so we decided to put a massive hole in it. Unfortunately, it’s the Aussies and Kiwis who are paying the price. The ozone layer is much thinner over there, which means there’s a dangerous amount of UV radiation whenever the sun shines. When you’re in New Zealand, even if the sunlight doesn’t feel very hot, you should still protect yourself properly. On the hottest days, we’d advise nothing less than a full suit of armour and a parasol. New Zealand is a hotbed of tectonic activity. The dramatically-named Pacific Ring of Fire is home to the majority of Earth’s volcanoes and earthquakes, and New Zealand sits right on top of it. This means the Kiwis experience around 14,000 quakes every year, although only about 100-150 of them can be felt by normal humans. It’s no wonder the country is known as the Shaky Isles. Volcanoes are less of a regular problem, but when they happen, they really happen. The world’s biggest volcanic eruption of the past 5,000 years took place in New Zealand, leaving a huge crater that filled with water and became the beautiful Lake Taupō. One of the volcanoes on the South Island (now dormant) is called Mount Horrible. Never has there been a more appropriate name for a volcano. If there was a beauty pageant for countries, New Zealand would probably win. It’s almost dangerously breathtaking. The country is spectacular from end to end, and about one third of it is made up of protected national parks. That means it won’t be turning into hotels and car parks any time soon. 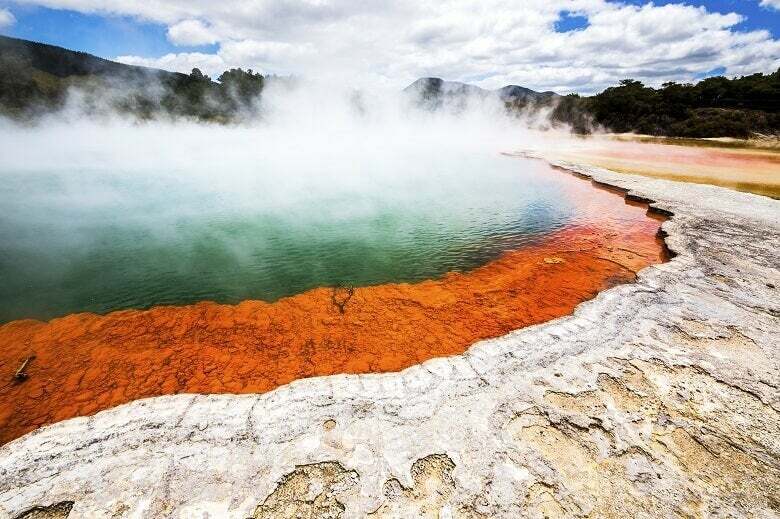 If you like freakishly colourful hot mud pools, check out Wai-O-Tapu on the North Island, while the South Island is home to the world-famous Milford Sound fjord. 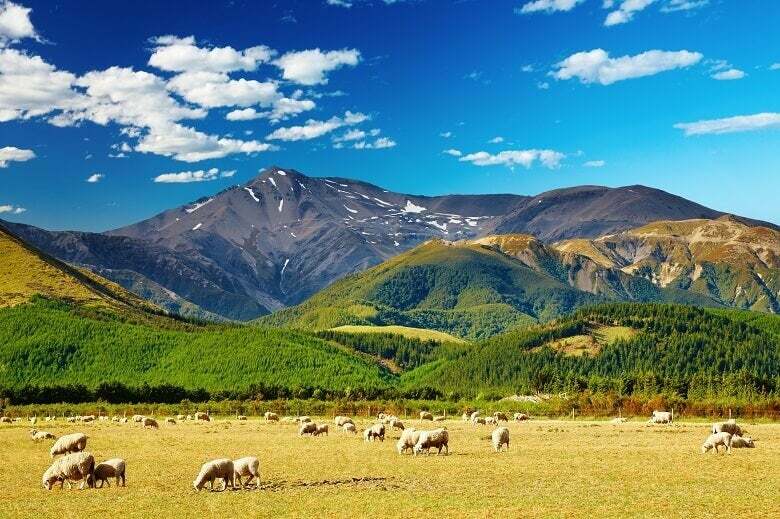 Icy mountains, forests, vast lakes and white beaches; New Zealand’s got the lot. What’s the main thing you look for in a lake? Well you can’t look for anything in a lake without transparency. New Zealand’s Blue Lake is the clearest lake in the world, according to New Zealand’s National Institute of Water and Atmospheric Research… and they’re not biased or anything. Situated in Nelson Lakes National Park on the South Island, Blue Lake offers visibility of up to 80 metres. That’s almost the same as distilled water. Māori have always regarded this lake as sacred, so you’re not allowed to use it as a bath for your gross body. Perhaps that’s how it’s stayed so clear. At literally any moment in New Zealand, you are never more than 128 km (about 80 miles) away from a beach. Obviously if you’re on foot then 80 miles may as well be 800 miles, but it’s only about an hour or so’s drive in a car. This makes emergency visits to the seaside very easy. Just watch out for the sharks (they’re like the Aussie sharks but they pronounce their vowels a bit differently). 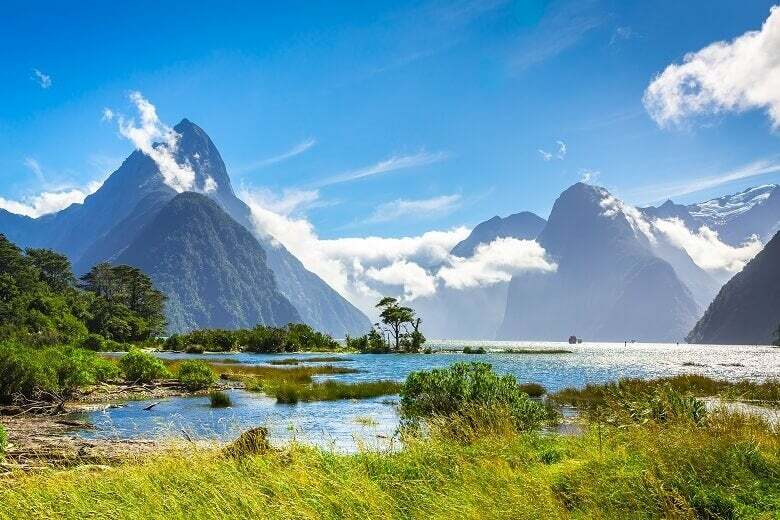 Some huge films have been shot in New Zealand, including King Kong, Avatar, The Chronicles of Narnia and, of course, The Lord of the Rings and The Hobbit franchises. Filmmakers just can’t resist having those Kiwi backdrops in their films. 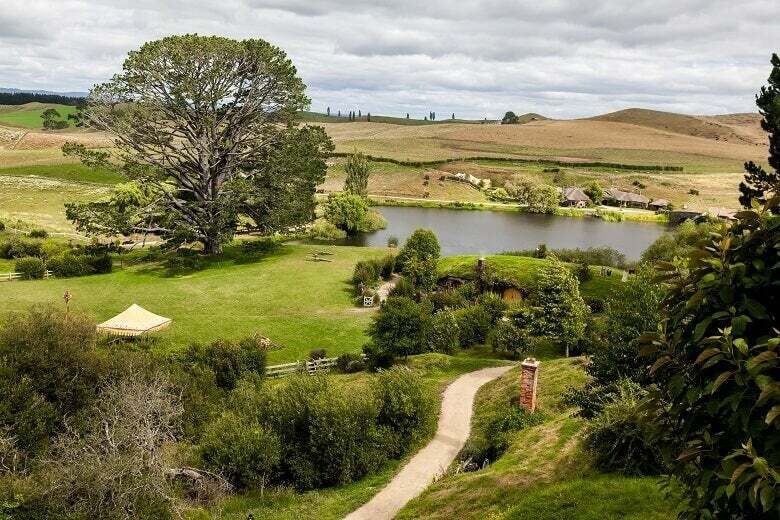 Tourism for The Lord of the Rings has been (and still is) a particularly massive cash cow for New Zealand, having pumped over $200 million into its economy so far. People come from all over the world to visit the filming locations that Peter Jackson used, including the village of Hobbiton (which is a real sheep farm) and the Tongariro Alpine Crossing (the one Frodo and Sam walked over to reach Sauron). It’s ok to be a nerd over there. That suit of armour we mentioned earlier might be needed again. You never see The Lord of the Rings characters having to deal with sandflies, but these winged pests are a seriously annoying problem across New Zealand. Only three of the 19 sandfly species actually bite humans, but these three cover nearly the whole country, especially on the South Island and along the West Coast. When a sandfly bites you, you really know about it (the pain is sharp and instant), but fortunately it won’t give you any diseases. It will just itch. A lot. They tend to hunt in airborne packs, so the moment you’ve swatted one away, its cloud of friends will want payback. The best way to defeat them is with wind and cold weather, so winter trips to New Zealand are advisable. You might think possums look fairly harmless, but in New Zealand these rat-like creatures are treated like the spawn of the devil. Back in 1837, some people decided to bring some possums over from Australia to kickstart a fur industry, and oh dear what an error that was. Possums ran rampant over the country, doing whatever the hell they wanted without a single natural predator to stop them. They give bovine tuberculosis to cows, they eat the eggs of kiwi birds and kea birds, and they collectively gnash through about 20,000 tonnes of vegetation every night. Humans have tried their best to bring the possums down, but there are still around 30 million of them rampaging around New Zealand. If a Kiwi spots a possum while driving down a road, it’s common for them to speed up, not slow down. We mentioned the poor defenceless baby kea birds getting eaten by possums, but once a kea bird grows up it can behave just as badly. Except it eats cars, not possums. 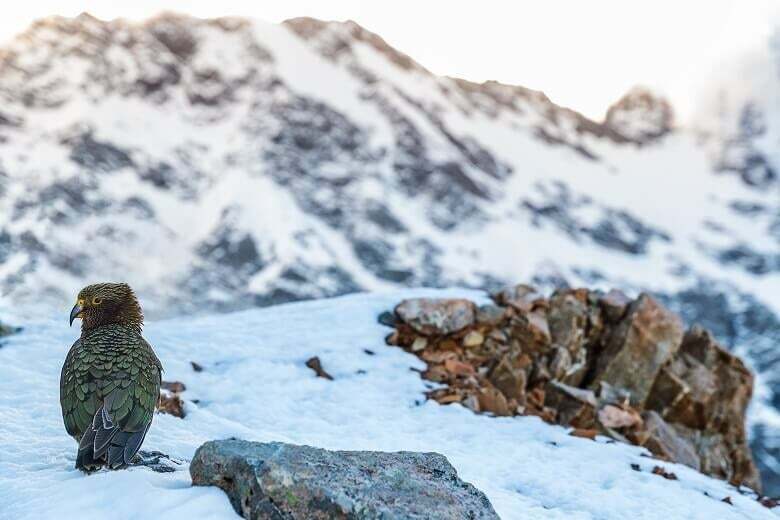 The New Zealand alpine parrot just loves attacking cars, ripping off windscreen wipers and tearing off the strips of rubber from windows. If vehicles aren’t on the menu, they’ll mess around with pretty much any object left unattended, and they won’t hesitate to steal food. This makes them deeply annoying, but they’re hardly a threat to human life. If anything, their curiosity and playfulness around people has actually made them rather loveable. Kea are one of the world’s most intelligent bird species, and in 2017 the Kiwis voted the kea their Bird of the Year. If a kea starts to dismantle your car, you just have to smile and admire its curiosity. Despite its name, the kiwifruit did not originate in New Zealand. We’ve all been fooled by a bit of marketing from about 50 years ago. This furry green fruit is native to China, so it was originally known as the Chinese gooseberry. In 1904, a lady called Mary Fraser brought some Chinese gooseberry seeds from China to New Zealand, and by 1910 the New Zealanders were growing their first Chinese gooseberries. Once the Americans started to buy the fruit from New Zealand in the 1950s, the US importers decided that the name ‘Chinese gooseberry’ just wouldn’t fly. They tried the cute-sounding ‘melonette’ first, before settling on ‘kiwi fruit’, named after New Zealand’s native kiwi bird. And here we are today, still being sold this fruity lie. New Zealand was the first country in the world to get the ball rolling with women’s suffrage, giving women the right to vote in September 1893. It would take almost a decade before any other country caught on (Australia in 1902). New Zealand’s momentous decision was largely down to the fierce campaigning of Kate Sheppard and her fellow suffragettes, so you’ll see her face on every NZ$10 note (on the back there’s a lovely blue duck). What’s more, New Zealand is still the only country to have its top three positions of power held by women; in 2006, the Prime Minister, the Governor General and the Chief Justice were all women. Sisters are doin’ it for themselves! That acronym might mean nothing to you, but to any New Zealander it means Lemon & Paeroa. It’s a very popular soft drink that you can get all over the country, but pretty much nowhere else in the world (bar a few supermarkets in Australia). So what’s actually in it? Paeroa is carbonated mineral water from the town of Paeroa, and lemon is a sour yellow fruit. Yes, it’s literally just lemonade. L&P no longer contains water that’s specifically from Paeroa; it’s now owned and produced by Coca Cola, who are slowly taking over all the drinks that ever existed. If you’re the dedicated driver on a night out in New Zealand, the popular Kiwi choice is a bottle of L&P. We can’t write an article about New Zealand without mentioning the rugby. The Kiwis go crazy for burly men throwing an oval-shaped ball around a field. In 1870, a New Zealander came home from a visit to England and taught all his mates the sport. About 30 years later, the All Blacks were born, and they were touring England and absolutely battering the English at their own game. Over a century later and the All Blacks still dominate the sport, beginning every international game with the world-famous ‘haka’ war dance. This clearly terrifies the hell out of everyone, because most opponents can’t find a way to beat the All Blacks. Hopefully you’re feeling pretty fired up about life in New Zealand. It’s a wonderland of magnificent landscapes, inquisitive birds and Chinese fruit. Unless you’ve been to New Zealand before, then you’ve never seen anything like it. If you’re thinking of moving there, we can help you. Fill in the form at the top of this page and our shipping suppliers will get back to you with their best prices.